The New South Wales Rural Fire Service declared the earliest total fire bans in its history this week. The entire state was declared to be in drought on the same day. The combination of winter drought and hot, dry weather has made dangerous fires increasingly likely. Already this week two fires on the south coast have escaped containment lines and destroyed houses. The weather during these fires was 6℃ warmer than the August average, dry and extremely windy. The wind speed peaked at 104 kilometres an hour in Bega and 85km/h in Nowra, two towns close to where fires broke out. Under these conditions, bushfires will spread quickly, produce large numbers of embers and are hard to stop. Our fire seasons now start earlier and last longer. This means we’re increasingly likely to see repeats of historically large fires threatening residential areas. Current dry conditions are reflected in the maps of live fuel moisture produced by Dr Rachael Nolan of Western Sydney University. Nolan R.H., Boer M.M., de Dios V.R., Caccamo G., Bradstock R.A. (2016), Large-scale, dynamic transformations in fuel moisture drive wildfire activity across southeastern Australia. Geophysical Research Letters 43, 4229-4238. This method tracks the weekly moisture content of the forests in southern Australia, as observed by NASA’s MODIS satellite. The latest map shows a patchy distribution of dry areas and a drying trend over recent weeks. It looks like NSW’s fire season has already started, and it’s likely to be bad. Last year’s fire season also extended well into autumn, with serious bushfires burning in mid-April. Fire agencies usually enjoy a six-month break from bushfires between April and September, but this year they had only three months’ respite. This reflects evidence of a trend toward more extreme fire weather over the past 30 years, and lengthening fire seasons. This problem is being keenly felt in western United States, where fire agencies have warned that the fire season now lasts all year round. Not only that, there is clear evidence climate change is increasing fire activity in the United States; the record for the largest fire in California history has been broken two years in a row. The most damaging fire season for NSW in the past 30 years was in October 2013 when the Linksview fire destroyed 200 houses in the Blue Mountains. The build-up to that season was eerily similar to this year, with a winter drought and bushfires in September, but the moisture maps show that the forests are drier now than at the same time in 2013, and we have already seen serious bushfires in August. As we move into September and October, the weather will warm, which means any remaining moisture in the ground and plants will evaporate even faster than at present, and fires will be more intense and spread faster. The only thing that will reduce the risk is soaking rain of at least 100mm. Whether or not that will occur in the next two months is almost impossible to predict. At the moment it seems unlikely. The Bureau of Meteorology’s latest seasonal forecast, issued on August 16, considers it likely that dry conditions will persist for the next three months. The heightened risk of bushfire this season should be a wake-up call for residents in bushfire-prone areas. Most people in really risky areas such as the Blue Mountains are well prepared, but many people who are a little more removed from the forests are not aware of the risk. For example, many residents of Wollongong probably don’t know this October is the 50th anniversary of the great 1968 fires that swept down the Illawarra Escarpment into the suburbs of Figtree, Bulli, Austinmer and others. The footprint of the 1968 Illawarra fires, which burned through residential areas. If the same footprint of fire were to occur again, some 5,000 houses would be affected. The present indicators suggest a repeat of this event is more likely than at any time for decades. Residents need to prepare a bushfire survival plan, which includes a decision on whether to stay and defend or to leave as soon as they learn about a nearby bushfire. Current research at University of Wollongong suggests that the biggest influence on the risk of house loss during a bushfire is the actions that the residents themselves take. This includes ensuring that natural and man-made fuels are kept to a minimum in the garden, especially close to the house, and also defending the house from spot-fires caused by embers. The Rural Fire Service has a wealth of advice for preparing for bushfires on its website. We’re look at a torrid upcoming fire season, dependent on the vagaries of the Australian climate. Either way, now is the time for people to brace themselves and get prepared. The Centre Alliance’s Rebekha Sharkie, who quit parliament in the citizenship crisis, has an early lead in her fight to win back her South Australian seat of Mayo, according to a ReachTEL poll. Sharkie is ahead of her opponent, the high-profile Liberal Georgina Downer, 58% to 42% on a two-party basis. The poll was commissioned by the Australia Institute, a progressive think tank. The Liberals have been hopeful of capturing Mayo, thus increasing their parliamentary majority. They held the seat until Sharkie, as part of the Nick Xenophon Team (since renamed the Centre Alliance) won it in 2016 from Jamie Briggs, who earlier had to resign from the ministry over a personal indiscretion. Georgina Downer is the daughter of Alexander Downer, a former occupant of the seat who was foreign minister in the Howard government. The vote is on July 28, when five byelections will be held in a Super Saturday across the country. The Liberals believe the long campaign will favour them in Mayo because Sharkie has much less in terms of resources. She is, however, well known in the electorate. The poll has her on a 40.1% primary vote, with Downer on 34.4%. Labor is polling 7.7%; the Greens 10.7%. The vote for “other/independent” is 3.5%, with 3.6% undecided. The sample was 1031 with polling on the night of June 5. The poll also asked whether company tax for large companies like banks, mining companies and supermarkets should be increased, kept the same or decreased. The results were: increased, 25.4%; kept the same, 44.9%; decreased, 24.8%. People were overwhelmingly opposed to the banks receiving a company tax cut (69.1% against). Asked how they would prefer to spend the $80 billion proposed to be spent on company tax cuts, 51.4% chose “infrastructure and government services like health and education”, 6.5% said personal income tax cuts, 29.1% said decreasing the deficit and repaying debt, and 8.7% said proceeding with the company tax cuts. Asked how the Senate should vote on the third stage of the budget’s income tax policy, which “removes the 37-cent income tax bracket altogether, meaning someone earning $41.000 would pay the same marginal tax rate as someone earning $200,000”, about two thirds (65.3%) said the Senate should oppose it, while 25.2% said it should vote in support. It might feel like the depths of winter, but Australian fire services are preparing for an early start to the bushfire season. Sydney has been covered with smoke from hazard reduction burns, and the New South Wales Rural Fire Service has forecast a “horrific” season. Predicting the severity of a bushfire season isn’t easy, and – much like the near-annual announcements of the “worst flu season on record” – repeated warnings can diminish their urgency. However, new modelling that combines Bureau of Meteorology data with NASA satellite imaging has found that record-setting July warmth and low rainfall have created conditions very similar to 2013, when highly destructive bushfires burned across NSW and Victoria. Crucially, this research has found we’re approaching a crucial dryness threshold, past which fires are historically far more dangerous. On September 10, 2013 several bushfires in Sydney’s West caused havoc well before the official start of the bushfire season. These were a precursor to fires that destroyed more than 200 properties a month later. Warm, dry winter weather had dried out the fuels in Sydney’s forests and bush reserves beyond “normal” levels for the time of year. The timing and severity of those preseason fires were a reminder that the region’s forests are flammable all year round; they can burn whenever the fuel they contain dries out past a certain threshold. In most forests, there is an abundance of fuel in the form of leaf litter, dead twigs, branches and logs, lower vegetation such as shrubs and grasses, as well as higher foliage and branches. The flammability of all these different kinds of fuel depends largely on their moisture content. Leaf litter and fine dead branches on the soil surface can dry out in a matter of days, whereas logs may take weeks or months to lose their moisture. The moisture content of shrubs and tree canopies varies depending on the amount of water in the soil, so they reflect the overall rainfall and temperatures across a whole season. The flammability of an entire forest is therefore a complex calculation of all these different kinds of fuel (both alive and dead) and their different moisture levels. In a recent collaborative study, we combined data from a Bureau of Meteorology project that maps water availability levels across Australia with satellite imagery to develop new tools for mapping and monitoring moisture levels of different fuels in forests and woodlands. We checked these tools by modelling fuel moisture levels during fires in NSW, Victoria and the ACT between 2000 and 2014, and comparing our predictions to historical bushfires. Our research has identified critical dryness thresholds associated with significant increases in fire area. Rather than a gradual increase in flammability as forests dry out, when dead fuel moisture drops below 15% subsequent bushfires are larger. Another jump occurs when dead fuel moisture levels fall below 10%. We found similar thresholds in growing plants, although their moisture content is measured differently. These dryness thresholds are pivotal, because they may represent the breakdown of moist natural barriers in landscapes that prevent fires from spreading. Understanding these mechanisms makes it possible to predict fire risk much more accurately. As part of this project we compared the fuel moisture in Sydney Basin’s forested areas in 2013 and 2017. 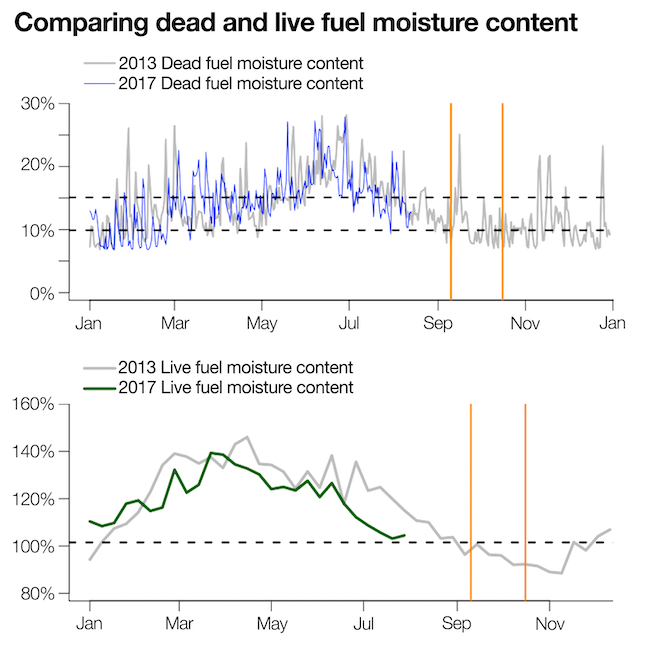 As shown in the chart below, currently the live fuel moisture level is tracking well below the 2013 values, and is approaching a crucial threshold (indicated by the dotted line). The moisture content of dead fuel has been more variable, but it has also dipped below the 2013 curve and, if warm dry weather continues, could reach critical levels before the end of August. The median predicted dead fuel moisture content and live fuel moisture content in forest areas of the Sydney Basin Bioregion in 2013 and 2017. Black dashed horizontal lines indicate fuel moisture threshold values. The start dates of major fires in 2013 are indicated by orange vertical lines. In another worrying sign, mapping shows critically dry live fuel is much more abundant in 2017 than it was in 2013. 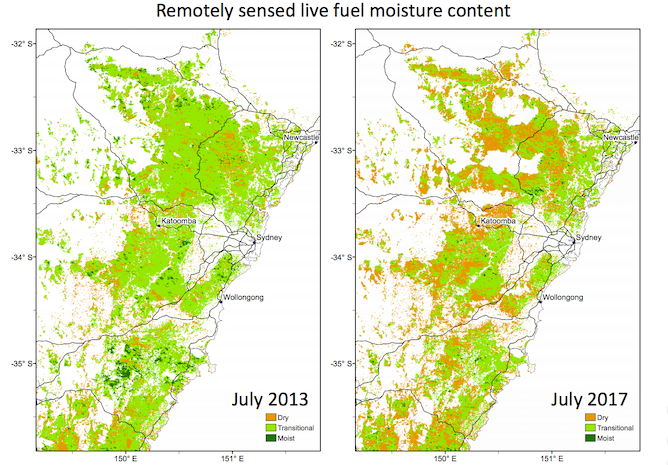 Remotely sensed live fuel moisture content in forest areas of the Sydney Basin Bioregion in July 2013 (left) and July 2017 (right). Click to enlarge. It’s clear that much of the Sydney Basin is dangerously primed for major bushfires, at least until it receives major rainfall. Forecasts for windy but largely dry weather in coming weeks may exacerbate this problem. These new insights into landscape-scale fuel dryness provide a powerful indicator of what might be expected. They also build our capacity for week by week monitoring of fire potential. Preparation by both fire management authorities and exposed homeowners is now an immediate priority, to cope with the strong likelihood of an early and severe fire season. The link below is to an article that appeared in Christianity Today concerning early marriage and the Christian. It’s probably a little simplistic and clearly ‘self-centred (and I don’t mean that in a bad sense here).’ Any thoughts out there on early marriage and the Christian – would love to read them in the comments. Body destroyed before being identified; police try to link him with poachers. NEW DELHI, June 14 (CDN) — A pastor in Assam state was murdered and cremated without being identified last month before family members learned of his death when they saw a photo of his body in a newspaper. The body of Son Englang, 35, was recovered alongside National Highway 37 on May 20, with marks indicating his hands had been tightly bound before he was shot. The pastor from Mallasi village, Karbi Anglong, supported by Gospel for Asia (GFA), had reportedly been kidnapped early in the morning of the previous day as he rode his bicycle to the Bokakhat marketplace to buy paint materials for his nearly completed church building. The unknown kidnappers, suspected Hindu extremists, reportedly took him to the jungle to kill him. Local police took his body to a hospital in Golaghat, where he was cremated without being identified after three days. “The hospital along with the local police cremated Pastor Englang’s ‘unclaimed body,’ as there is a provision in the hospital of holding a body for a maximum of three days,” said the Rev. Juby John, Karbi Anglong diocesan secretary of GFA. News of his death reached his family four days after he was killed when they saw a photo of his body published on May 22 in local newspapers reporting him as unidentified. Anti-Christian elements in the area likely had taken note of Pastor Englang’s fearless evangelism and the church building on the verge of completion, John said. Along with his wife, Pastor Englang is survived by a 6-month-old son and a 3-year-old daughter. He had served with GFA since 1996, ministering in Karbi Anglong, about 30 kilometers (19 miles) from the site where his body was recovered. Local media reported his death along with those of three poachers who had illegally entered Kaziranga National Park to hunt rhinoceros and were shot by park guards. The bodies of the three poachers were recovered from the park the same day that police found Pastor Englang dead on the highway. Strangely, police reported Pastor Englang as a poacher accompanying the three who were killed inside the wildlife park. Investigations are underway regarding the suspicious claim, resulting in the arrest of a park guard and a local policeman. Questioned by media, police were unable to explain why Pastor Englang was included with the poachers given the large distance between his body and the three recovered inside the park. They were also unable to explain the marks of binding on Pastor Englang’s hands. “There was no weapon discovered on the pastor, whereas there were ammunitions recovered from the trespassers,” John told local newspapers. John emphasized that Pastor Englang worked day and night on the construction of his church building for the past five months. John said he went to visit Pastor Englang’s family and the church building under construction on May 24. Hindu extremists have a presence in the state. Hemanta Das, a 29-year-old Christian worker whom Hindu extremists had warned to stop his ministry, succumbed to injuries in a hospital on July 1, 2007, two days after extremists beat him in the Chand Mari area of Guwahati. A convert to Christianity from Hinduism, Das previously had been a supporter of the Hindu extremist Rashtriya Swayamsevak Sangh. The All India Christian Council (AICC) later wrote to state officials requesting that those who killed Das be arrested and the Christian minority community protected from such attacks. AICC noted that Hindu extremist groups had warned Das of “dire consequences” if he continued preaching Christ. At that time the Rev. Madhu Chandra, an AICC leader from northeast India, told Compass the presence of Hindu extremist groups in the state was very high. “When I was working with a Christian organization in the state till a few years ago, many of our workers would be attacked by extremists,” Rev. Chandra said. The Twenty20 World Cup has begun in the West Indies with early victories to New Zealand (over Sri Lanka), the West Indies (over Ireland), Pakistan (over Bangladesh) and India (over Afghanistan). Pastor, two others held in pagoda in attempt to force them back to Buddhism. DHAKA, Bangladesh, April 23 (CDN) — Buddhist members of an armed rebel group and their sympathizers are holding three tribal Christians captive in a pagoda in southeastern Bangladesh after severely beating them in an attempt to force them to return to Buddhism, Christian sources said. Held captive since April 16 are Pastor Shushil Jibon Talukder, 55; Bimol Kanti Chakma, 50; and Laksmi Bilas Chakma, 40, of Maddha Lemuchari Baptist Church in Lemuchari village, in Mohalchari sub-district of the mountainous Khagrachari district, some 300 kilometers (186 miles) southeast of Dhaka. They are to be kept in the pagoda for 15 to 20 days as punishment for having left the Buddhist religion, the sources said. Local Buddhists are considered powerful as they have ties with the United Peoples Democratic Front (UPDF), an armed group in the hill districts. After taking the Christians captive on April 16, the sources said, the next day the armed Buddhist extremists forced other Christians of Maddha Lemuchari Baptist Church to demolish their church building by their own hands. The extremists first seized all blankets, Bibles and song books from the church building. The sources said two UPDF members went to Pastor Talukder’s house at 7 a.m. on April 16, telling him to go to a Buddhist community leader’s house in a nearby village. The Buddhist leader also ordered all members of the Baptist church to come to his house, and about 15 Christians did so. After a brief dispute, the Buddhists chose the pastor and the two other Christians and began beating them, seriously injuring the pastor. They then took them to a nearby pagoda for Buddhist baptism, shaving their heads and dressing them in saffron robes as part of a conversion ritual. The sources said Pastor Talukder was bludgeoned nearly to death. Pastor Talukder was treated in the pagoda with intravenous, hypodermic injections that saved his life, the source said. The Buddhist extremists were said to be forcing other Christians to undergo Buddhist baptism in the pagoda and to embrace Buddhism. A source in Khagrachari district told Compass that local UPDF Buddhists had been mounting pressure on the Christians since their church began in the area in early 2007. In June the Buddhists had threatened to harm Pastor Talukder if he did not give up his Christian faith. The pastor escaped and hid in different churches for two months. Later he came back in the area and began his pastoral and evangelical activities anew. “They also made threats and gave ultimatums to three or four other churches in the locality to try to force them to come back to Buddhism,” the source said. Regional Sub-district Chairman Sona Ratan Chakma told Compass that the “three renegade Buddhists” are being kept in the pagoda for religious indoctrination. “They were punished so that they can come to their senses,” he said. The Rev. Leor P. Sarkar, general secretary of Bangladesh Baptist Church Fellowship, told Compass that the UPDF’s ultimatum was of grave concern. “This armed group issued an ultimatum that by April 30 all Christians should come back to Buddhism, otherwise all of them will face the same consequences,” said Sarkar. Christians are virtually in a state of siege by the UPDF, he said. None of them go to church buildings on the traditional worship days of Friday or Sunday, instead worshipping in their own houses. Sarkar added that the tribal Christians do not have any political conflict with the UPDF. The UPDF’s order to give up their faith is a matter of life and death, Sarkar said. The church leader urgently appealed to local government officials to come to the aid of the kidnapped Christians. The UPDF is one of two main tribal organizations in the hill districts, the other being the United People’s Party of the Chittagong Hill Tracts (Parbatya Chattagram Jana Sanghati Samiti, or PCJSS). The PCJSS, formed in 1973, had fought for autonomy in the region for 25 years, leaving nearly 8,500 troops, rebels and civilians killed. After signing a peace accord in 1997 with the Bangladesh government, the PCJSS laid down arms. But the UPDF, a political party founded in 1998 based in the Chittagong Hill Tracts, has strong and serious reservations against the Chittagong Hill Tracts Accord signed 1997. Claiming that the agreement failed to address fundamental demands of the indigenous Jumma people, the UPDF has pledged to fight for their full autonomy. Last year the PCJSS demanded that the government ban the UPDF for their terrorist activities in the hill districts. The Chittagong Hill Tracts region comprises three districts: Bandarban, Khagrachuri and Rangamati. The region is surrounded by the Indian states of Tripura on the north and Mizoram on the east, Myanmar on the south and east. Christians await court decision on assaults on services by ultra-orthodox Jews. ISTANBUL, April 23 (CDN) — After a final court hearing in Israel last week, a church of Messianic Jews awaits a judge’s decision that could force an ultra-orthodox Jewish organization to publicly apologize to them for starting a riot and ransacking a baptismal service. A ruling in favor of the Christian group would mark the first time an organization opposing Messianic Jews in Israel has had to apologize to its victims for religious persecution. In 2006 Howard Bass, pastor of Yeshua’s Inheritance church, filed suit against Yehuda Deri, chief Sephardic rabbi in the city of Beer Sheva, and Yad L’Achim, an organization that fights against Messianic Jews, for allegedly inciting a riot at a December 2005 service that Bass was leading. Bass has demanded either a public apology for the attack or 1.5 million shekels (US$401,040) from the rabbi and Yad L’Achim. The case, Bass said, was ultimately about “defending the name of Yeshua [Jesus]” and making sure that Deri, the leadership of Yad L’Achim and those that support them know they have to obey the law and respect the right of people to worship. “They are trying to get away from having any responsibility,” Bass said. On Dec. 24, 2005, during a baptismal service in Beer Sheva, a group of about 200 men pushed their way into a small, covered structure being used to baptize two believers and tried to stop the service. Police were called to the scene but could not control the crowd. Once inside the building, the assailants tossed patio chairs, damaged audiovisual equipment, threw a grill and other items into a baptismal pool, and then pushed Bass into the pool and broke his glasses. “Their actions were violent actions without regard [for injury],” Bass said. In the days before the riot, Yad L’Achim had issued notices to people about a “mass baptism” scheduled to take place at the facility in the sprawling city of 531,000 people 51 miles (83 kilometers) southwest of Jerusalem. In the days after the riot, Deri bragged about the incident on a radio talk show, including a boast that Bass had been “baptized” at the gathering. The 2005 incident wasn’t the first time the church had to deal with a riotous attack after Yad L’Achim disseminated false information about their activities. On Nov. 28, 1998, a crowd of roughly 1,000 protestors broke up a Yeshua’s Inheritance service after the anti-Christian group spread a rumor that three busloads of kidnapped Jewish minors were being brought in for baptism. The assailants threw rocks, spit on parishioners and attempted to seize some of their children, Bass said. In response to the 1998 attack and to what Bass described as a public, cavalier attitude about the 2005 attack, Bass and others in the Messianic community agreed that he needed to take legal action. “What is happening here has happened to Jews throughout the centuries,” Bass said about persecution of Messianic Jews in Israel, adding that many in movements opposed to Messianic Jews in Israel are “arrogant.” He compared their attitudes to the attitudes that those in Hamas, a Palestinian group dedicated to the destruction of the State of Israel, have toward Israelis in general. “They say, ‘Recognize us, but we will never recognize you,’” Bass said. Bass has fought against the leadership of Yad L’Achim and Deri for four years through his attorneys, Marvin Kramer and Kevork Nalbandian. But throughout the process, Kramer said, the two defendants have refused to offer a genuine apology for the misinformation that led to the 2005 riot or for the riot itself. Kramer said Bass’s legal team would offer language for an acceptable public apology, and attorneys for the defendants in turn would offer language that amounted to no real apology at all. Despite several attempts to reach Yad L’Achim officials at both their U.S. and Israeli offices, no one would comment. The hearing on April 15 was the final chance the parties had to come to an agreement; the judge has 30 days to give a ruling. His decision will be issued by mail. Bass said he is a strong supporter of Israel but is critical of the way Messianic Jews are treated in the country. Kramer said that the lawsuit is not against the State of Israel or the Jewish people, but rather for freedom of religion. “It has to do with a violation of rights of individuals to worship in accordance with the basic tenants of their faith and to practice their faith in accordance with their beliefs in accordance with law,” he said. Bass’ lawsuit is just one of many legal troubles Yad L’Achim is facing. In February, the Jerusalem Institute of Justice (JIJ), a civil rights advocacy group, filed a petition asking Attorney General Yehuda Weinstein to declare Yad L’Achim a terrorist organization and order that it be dismantled. In the 24-page document Caleb Myers, an attorney for JIJ, outlined numerous incidences in which Yad L’Achim or those linked with it had “incited hatred, racism, violence and terror.” The document cited instances of persecution against Christians, as well as kidnappings of Jewish women from their Arab partners. According to the document, Yad L’Achim went after people it viewed as enemies of ultra-orthodox Judaism. The group particularly targeted Messianic Jews and other Christians. Particularly damning in the document was reported testimony gleaned from Jack Teitel. Teitel, accused of planting a bomb on March 20, 2008 that almost killed the teenage son of a Messianic Jewish pastor, told authorities that he worked with Yad L’Achim. “He was asked to talk about his activity in Yad L’Achim and related that for some five years he was active in the organization, and on average he helped to rescue about five women each year,” the document read, using the Yad L’Achim term “rescue” to refer to kidnapping. The 2008 bombing severely injured Ami Ortiz, then 15, but after 20 months he had largely recovered. Teitel, who said Ortiz family members were “missionaries trying to capture weak Jews,” has been indicted on two cases of pre-meditated murder, three cases of attempted murder, carrying a weapon, manufacturing a weapon, possession of illegal weapons and incitement to commit violence. In interviews with the Israeli media, Yad L’Achim Chairman Rabbi Shalom Dov Lifshitz said his organization wasn’t connected with the attacks of the Ortiz family or with Teitel. Her new Christian faith deepens; authorities allow evangelist Luis Palau to address pastors. Attorney Le Thi Cong Nhan’s sentence had been reduced by one year after an international outcry over her sentencing. She was released on March 6. Remaining in prison for another year is her colleague, Christian lawyer Nguyen Van Dai. The 31-year-old Cong Nhan had also supported a labor union that sought to be independent. Now serving an additional three-year house arrest sentence, Cong Nhan said in a surprisingly frank interview with Voice of America’s Vietnamese language broadcast on March 9 that she has no intention of giving up her struggle for a just and free Vietnam and accepts that there may be a further price to pay. Cong Nhan, arrested in March 2007, received a Vietnamese Bible from a visiting delegation of the U.S. Commission on International Religious Freedom – with official permission from Vietnam’s minister of Public Security – early in her incarceration, but she had to struggle constantly to retain it. Twice she went on a hunger strike when authorities took the Bible away from her. She had become a Christian shortly before her arrest, and she told Voice of America that while in prison she was able to read the entire Bible. Her prison experience has confirmed her calling and faith, she said. While Christians in several parts of Vietnam are still subject to abuse from local officials, the country’s national authorities have continued to allow high-profile Christian events. On March 17, renowned U.S. evangelist Luis Palau was allowed to address more than 400 pastors in a day-long event at the New World Hotel in Ho Chi Minh City. Palau, who had arrived in Hanoi with his entourage on March 13, had addressed nearly 200 Hanoi area pastors at an evening event at the Hanoi Hilton on March 14. The two events were streamed live on http://www.hoithanh.com, a popular website that reports on Protestant news in Vietnam. Hundreds of Vietnamese in Vietnam and abroad were estimated to have watched the presentations. The events were deemed significant, if not historic, by Vietnam’s Christian leaders. Very rarely is a prominent foreign Protestant leader allowed to address Vietnamese leaders, especially one from the United States. The events were significant also in that they brought together leaders from virtually all segments of Vietnam’s fractured and sometimes conflicted Protestant groups, Christian leaders said. The gatherings included leaders of open churches and house churches, registered and unregistered churches, and urban and even ethnic minority groups from Vietnam’s remote mountainous regions. Two representatives of a Mennonite church headed by activist pastor Nguyen Hong Quang, however, were turned away by police. Palau and Mike McIntosh, pastor of San Diego mega-church Horizon Christian Fellowship, strongly challenged the Vietnamese church leaders to strive for unity. The assembled pastors were challenged to put aside past conflicts and suspicions for the sake of the Kingdom of God in Vietnam, with Palau saying that unity was a requirement for God’s blessing on their churches and nation. Some Vietnamese leaders responded by expressing remorse for their divisions and committed to start working toward reconciliation. Organizers and participants said they hope such short events will lead to larger gains. Though the Luis Palau Association had originally planned for a two-day event for 2,000 pastors, most agreed this was an unprecedented first step toward a bigger goal. With an invitation from all segments of the Protestant community in Vietnam in hand, the Luis Palau Association is prepared to help organize evangelistic festivals in Vietnam in 2011, the centenary of Protestantism in Vietnam. One prominent overseas Vietnamese leader wondered if Palau’s visit to Vietnam could be compared to Billy Graham’s visit to Moscow during the Soviet Communist era. Also sharing testimonies during the March 17 event were Rick Colsen, a top Intel executive, and John Dalton, Secretary of the Navy under President Clinton.